Now offering FARM TO PRESCHOOL organic lunch! What do Google’s founders, Larry Page and Sergei Brin, Amazon’s Jeff Bezos, and Wikipedia founder, Jimmy Wales, all have in common? They all went to Montessori school. Welcome to MorningStar Montessori Academy Cedarburg, the little school with the big heart, bigger ideas, and most of all, where children really love to learn! MorningStar Montessori Academy is so fortunate to have parents and families who are willing to travel from all parts of Ozaukee, Milwaukee, and Washington Counties just to bring their children to our year round Cedarburg preschool and childcare. MorningStar Montessori Academy brings the world to the children, and all year round endeavors to bring the children to the world. While MorningStar Montessori Academy is located in the heart of historic Cedarburg, we are a league of many nations at its best. Our diverse teachers and families encompass a wide variety of cultures, customs, languages, and faiths; and what brings us all together is the strong desire to provide the best educational experience for each of our children – MorningStar Montessori Academy does just that. Following AMI's, Association Montessori Internationale, stringent guidelines, MorningStar Montessori Academy seeks to provide a "home" during the school day for each child to love … a place to feel comfortable, to feel nurtured, a place to balance rest, work, and play. Our Southeastern Wisconsin Montessori Preschool prides itself on the great value of nature, both indoors and out. Incorporating a sense of discovery and exploration, with the keenest eyes, our children observe and experience plant-life and the many different species of animals in our own classrooms, and in the fields and forests around our school. MorningStar Montessori Academy Cedarburg preschool and childcare values each and every child as a beautiful, one-of-a-kind creation in progress, not to be hindered, but to be encouraged and given the tools and love to properly grow. Respect for the child, respect for the materials in the Montessori classroom, respect for the entire environment, and respect for one another. 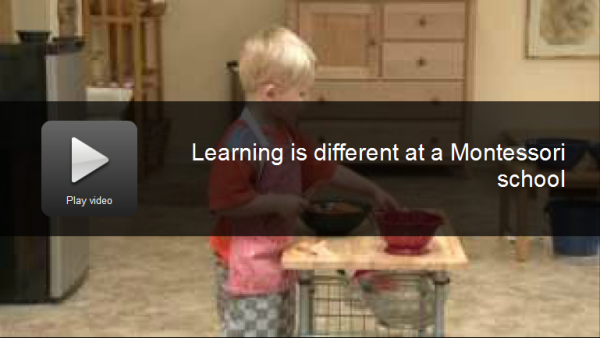 MorningStar Montessori Academy is a place where children learn without realizing it. Their joy is so great - it is a place of Elan Vital - a place for a child to fulfill his or her Vital Life-force with the joy of living each day. MorningStar Montessori Academy is an independent, Milwaukee area private preschool and childcare on the path to accreditation through AMI, Association Montessori Internationale, standards and seeks to establish and implement only the best foundational and educational opportunities possible for each child. © Copyright 2019 MORNINGSTAR MONTESSORI SCHOOL Cedarburg, Wisconsin | All Rights Reserved.